Property 4: Village House Set In Quiet Spot. Close to Beaches And Town Centre. Property 23: Classical Mansion " Arxontikon "
ST GEORGE original house in Platania village in Rhodes, Greece. Property 38: ST GEORGE original house in Platania village in Rhodes, Greece. THE F.J. TRADITIONAL HOUSE IS A SPECIAL EXPERIENCE FOR SPECIAL PEOPLE. Property 41: THE F.J. TRADITIONAL HOUSE IS A SPECIAL EXPERIENCE FOR SPECIAL PEOPLE. BLUE HOUSE next to a sandy beach Galazio in Faliraki . Lila BLUE and BLUE HOUSE. 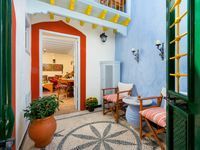 Property 45: BLUE HOUSE next to a sandy beach Galazio in Faliraki . Lila BLUE and BLUE HOUSE. The property was lovely, clean and roomy. Ria was super nice and very responsive with my questions. We rented a car and parking was easy and always available on the street. Highly recommend! One of the main reasons we decided to go to Rhodes was because we saw this property and thought it was the most adorable place we had ever seen. It did not disappoint! It is located is a charming area of the old town with quiet, gorgeous streets. It is near to restaurants, shops, and the castle. The hosts were incredibly nice and willing to help with whatever we needed. The property is clean and very cute. If you are going to Rhodes, I would suggest you stay here for an amazing experience. Rhodes is now my favorite Greek island thus far, and I cannot wait to go back!